Developer Quote: "Watch GazziliWords challenge Preschoolers with important words that can otherwise be difficult to define and describe—like fingerprint, internet, and blood—in a fun, kid-friendly way!" We get so caught up in our daily work and activities that it's often easy to neglect our children's education. However, these days with our modern technology, kids can play educational games that make the most of their free moments. This allows parents to do the tasks they must accomplish while seeing their little ones happily engaged in learning to read and write. 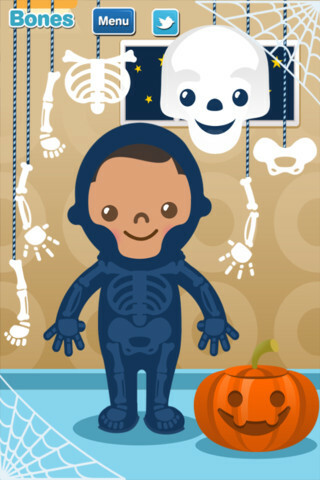 With the upcoming holidays, perhaps the best friend a parent could have is a fun, learning app such as GazziliWords. - Try the first 3 GazziliWords for Free! The unique approach to GazziliWords is demonstrated in its use of teaching many words which define morals and concepts. Think of the benefits of your preschooler understanding abstract concepts such as patience, rainbows, dreams, healthy, balance and other words that require a little more reflection. To me, this app portrays a threefold curriculum as learning is based on not just definitions, but on true meanings behind each word. 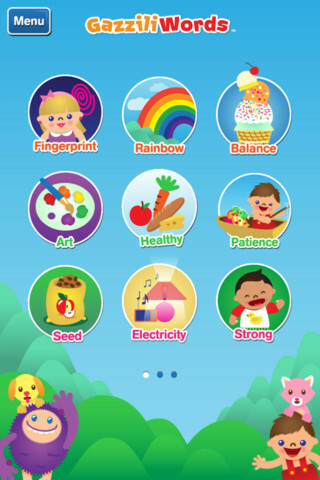 Additionally, as your child navigates his way through the app, a love and knowledge of technology comes into play. GazziliWords provides you with 3 words to get your child engaged in learning abstract and concrete words - (Fingerprint, Rainbow, and Balance). 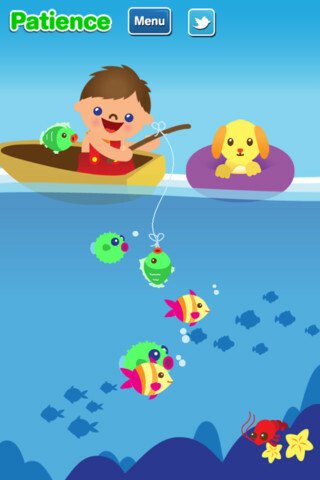 These words will whet your child's appetite for more exciting and colorful adventures which is why you are also able to purchase in-app additional word packs for 99 cents each. Check out Settings to adjust toggle options such as: Read To Me, Sound FX, Music, Instructions and Twitter. Open your screen to soft music and animated figures. 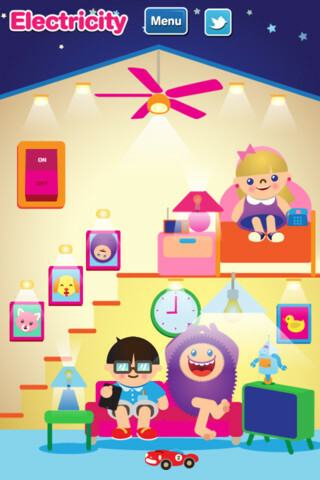 As your little one taps a word on the display, adorable explanations and games come into play. An example is offered as to the word's meaning while afterwards you are displayed an animated activity page further describing the word. For example, make little fingerprints on your screen to demonstrate the word, Fingerprint. Or, wipe the rain away in order for the Rainbow to appear to understand that word! The lovely graphics suitable for the preschool age intrigues the senses of children. Add to that some lively music and appropriate, matching sounds and you've got yourself a winning preschool app with superb multi-sensory action! Tap the arrow at the end of the display to move from one word to another. A strong vocabulary is the basis of a solid learning foundation and more effective communication between family members. Parents, you should also know that this app has been carefully created with early-childhood, educational experts from leading universities to ensure its valuable educational benefits to your child. In fact, GazziliWords is the brand, new re-make of the Webby-nominated children's educational app, GoodieWords. I recommend that you permit your child's natural curiosity and intellect to take on the innovative vocabulary challenges of GazziliWords! --Special Note: Top in-app purchases for 99 cents are available. Also see GazziliShapes at the App Store.